Swansea manger Garry Monk deserves a new contract at the Liberty Stadium, according to captain Ashley Williams. The Swans lost to Manchester City on Sunday, ending their hopes of European qualification, but have sealed their highest Premier League finish of eighth place with a record points total. The club have started contract talks with Monk and the 36-year-old hopes to commit himself to the Welsh side. "It's what he deserves. He's kept driving us on," said Williams. Monk has two years left on his current deal and Williams, 30, says a new contract would be just reward for an impressive first full season in management. "We're pleased with the way the season has gone," said the centre-back. "The main thing is that we keep getting better each year and I think this season we have really progressed. "The pleasing thing about this season is that we've played different styles, different formations and got wins. "We've all learned lessons this year and it will be nice now for myself, the manager and all the senior guys to really put our brains together and see what worked, what didn't work and which direction we want to go in next season." But Match of the Day pundit and former England defender Martin Keown warns the Swans could struggle to keep hold of their star names after an impressive year, which has included league doubles over both Manchester United and Arsenal. "This summer is going to be about keeping hold of some of these really good players, because there are a lot of noises in the game that they could lose their players," Keown said. "I expect the manager to stay there - he's a young talent himself - but you look at the quality that they have, particularly [Gylfi] Sigurdsson and [Jefferson] Montero as well on that wing, destroying full-backs. "These are really good players that they will be fighting to hold on to." Swansea's Garry Monk and Ashley Williams hold the Capital One Cup trophy aloft after beating Bradford City 5-0 at Wembley in 2013. 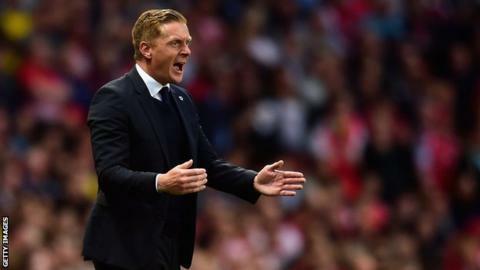 Monk has said he is disappointed his side will not be playing in next season's Europa League, but Williams is relieved there will no repeat of the Swans' 2013/14 European campaign. "I really enjoyed playing [in the competition], but it was very difficult and you see that most teams that play in it suffer in the Premier League," he said. "It was one of those that if we got it, then brilliant [and] we will enjoy it, but if you don't get it then that's great as well. "I'm glad that I've played in it at least once in my career and if we had [qualified] then it wouldn't be all doom and gloom... but I would prefer to concentrate on the Premier League. "The focus this week will be trying to finish on a good note [at Crystal Palace] because I've lost the last game of the season before and it's not nice."